Yesterday was my first race as a collegiate road cyclist and marked the first race of the ACC Cycling season since Saturdays race was canceled. We woke up at 5:45AM and packed up our stuff to put in the vans since we'd be leaving for home right from the race. A quick breakfast including bagels, scrambled eggs, and orange juice provided by our awesome host's, the McDonell's started the morning off right. 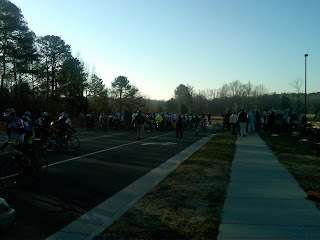 Breakfast was followed by a short half our ride to the high school where the race was being hosted. 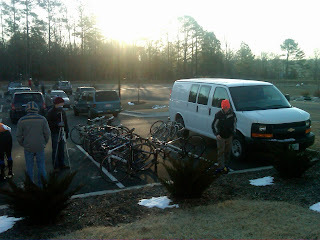 When we arrived it was 27 degrees out, pretty chilly to racing bicycles and even worse to sit outside all day, instead most of the day was spent sitting in our 12 person passenger van sleeping/trying to conserve energy for our races later in the day. 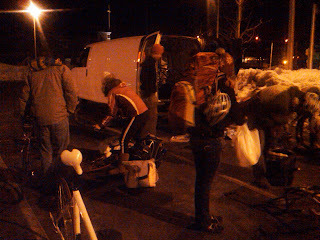 The race scene at 7AM, unloading bikes! The Mens Collegiate A field and the Pro 1, 2, 3 races were up first with 8 and 9 laps respectively. 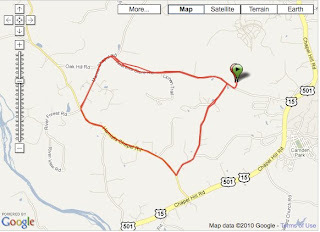 The course was a seven mile loop that consisted of rolling hills, four right turns, and LOTS and I mean LOTS of potholes. Because of the snow from the previous day, the races were delayed 30 minutes and the fields were combined and shortened to 7 laps for both races. The course lap average was about 20 minutes; we watched the first few laps and spent the rest of the morning relaxing in the van, attempting to stay warm (attempting because it was rather unsuccesful). As the day progressed other fields raced, Men's A place fairly well overall with our two riders placing high. 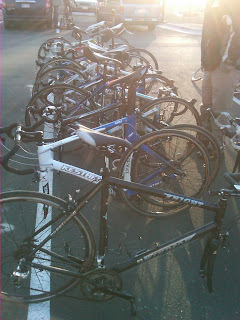 We had three women ride in the B field, all enjoyed their first collegiate races. 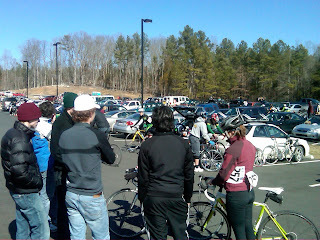 Around 11:30 we ran to Harris Teeter and grabbed some much needed energy and then headed back to catch the end of the fields before my race, the Men's Collegiate C.
Around 2:30 I began preparing for my race, checking tire pressure, pinning numbers onto my jersey, and getting suited up for what was sure to be a cold race as the sun set. The seven of us racing men's c went for a warm-up to prepare our muscles for the hour of agony soon to come. The men's collegiate field was pretty large with about 50 rides from divisions 1 and 2 of the ACC. Appalachian State, Duke, The Naval Academy, N.C. State, UNCW, W&M, and a bunch of others were all well represented. With the sound of a whistle we were off. 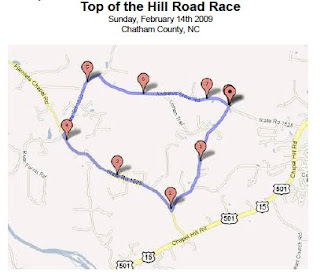 I had great positioning on the line and was maybe the 10th person around the first turn and rode in the top 15-20 for the first lap-lap-1/2 before I popped on a significant incline ("popped"-meaning I was gased, and fell back) catching the main field once more before I finally went off the back at the end of the second lap. I found a few other tech riders who were also off the back and we quickly made a paceline picking off stragglers from the peloton one-by-one. When we came across the finish line to begin our 4th and final lap the race official blew his whistle signaling we were done. Bummer!!! First collegiate race and only finished 3 of 4 laps. I was happy to see however that the finish pack was only about 1o-15 riders deep, the rest had either wrecked, taken themselves out of the race, or been pulled. Power Data from the Race, ouch! 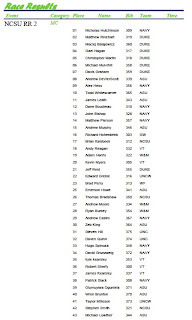 Race Results went up today, I finished 36th out of 45 total that finished, 54 total in the field at the start. Overall the race was an excellent experience allowing me to gauge my fitness level compared to my teammates as well as other members of my conference. I have a lot of work to do, especially in regards to high-intensity interval training focusing on anarobic efforts. It was a long weekend but I learned a ton and I'm excited for next weekends three races, including a prologue (short time trial), road race, and criterium, at Wake Forest. After grabbing an awesome dinner at Armadillo in down town Chapel Hill we began the long 3.5 hour drive home, finally arriving around 10:30. The best part of the day was coming home to Michelle and my homemade chocolate covered strawberries for Valentines day! 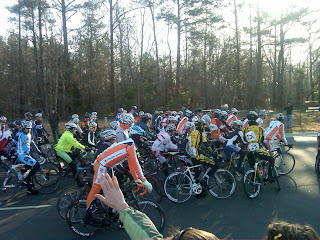 Posted by Unknown at 9:23 AM I'm reading from MyDailyGround: NC State Cycling Weekend Day 3 Tweet this!